The Eno River’s newest threat is one that has come a long way: Hydrilla (Hydrilla verticillata), an invasive aquatic plant species from Asia. Unfortunately, hydrilla has become an all too common sight within the Eno. Typically hydrilla is not able to establish in river systems because of the strength of the water flow. However, the Eno’s flow is slower and lighter than many other rivers, making it possible for the species to take hold. It is unknown exactly how hydrilla was introduced into the Eno. It is commonly sold in the aquarium trade, so it is possible that it spread through the dumping of aquariums into local waterways. It could also have hitched a ride on fishing equipment that had been used in an infested area or even transported by birds. Hydrilla impacts the river in ways that are harmful and wide reaching. It crowds out native aquatic plant species, essentially taking over as the only plant in large stretches of the river. This destroys the habitat of larger fish, including the state threatened Roanoke bass, by making it difficult for them to find the smaller fish they eat. Hydrilla can also affect water quality by decreasing dissolved oxygen, increasing pH, and increasing water temperatures through the absorption of sunlight. The effects on humans are significant as well. Dense mats of hydrilla can compromise the ability to swim, fish, and boat, while also creating mosquito breeding habitat in stagnant sections of hydrilla-filled water. On top of it all, a neurotoxin produced by blue-green algae that appears to preferentially grow on hydrilla can cause death in waterbirds that eat an infected plant and in predatory birds, such as eagles, that eat the waterbirds. At present there are no good solutions for controlling this growing problem. It is nearly impossible to hand-pull an entire plant or remove the leftover seed bank. All a plant needs to grow back to full size after it is manually removed is for a very small fragment of vegetation to remain behind. Worse, each tiny piece that breaks off during pulling can float downstream and establish itself as an entirely new plant. Larger scale control methods, such as aquatic herbicides and sterile grass carp, have successfully controlled hydrilla in reservoirs or lakes. However use of these methods in flowing waterways such as the Eno is more problematic. The better news is that controlling hydrilla has become a hot topic for State and local resource managers and researchers around the region. In order to get a handle on the scope of the problem, a survey was conducted in 2013 to determine where along the river hydrilla had spread. With this data in hand, the next phase of addressing the problem was implemented in spring 2014 when a small test group of sterile grass carp were introduced into the Eno River. Through this experiment, researchers tracked the movement and feeding activity of the carp. 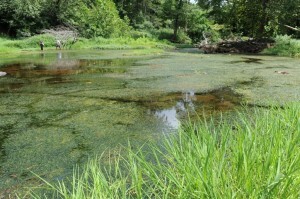 This treatment method was found to not be a feasible control method for hydrilla in the Eno. After much discuss by the Eno River Hydrilla Management Task Force, the decision was made to run a two year pilot study and treat hydrilla using the aquatic herbicide, Fluridone. Prior to the release of the herbicide, studies were conducted to test the effects of Fluridone on fish, crayfish, Panhandle Pebblesnail, and aquatic vegetation. The Fluridone treatment started on May 29, 2015 and concluded for the year on July 20, 2015. By July 27 or soon afterwards, the entire Eno River was flushed of fluridone, at least at detectable levels. The injection unit was turned off as a cautionary act responding to a report on anecdotal observations of water willow and riffleweed being impacted. With further evaluation, no significant difference in riffleweed condition was found. Water willow within the treatment zone did express some chlorosis which was expected, but has since recovered with new, non-chlorotic leaf growth. Hydrilla was found to be controlled to a large extent. Since the treatment attained 95% hydrilla control and additional treatment would incur additional cost with diminished return, Eno River Hydrilla Management Task Force decided not to resume further treatment this year. Hydrilla has begun to regrow from new tubers or remnant older tissue and will be relatively rapid through summer. Year two of the pilot project is scheduled to begin this spring with some minor improvements. The chemical Fluridone will be used again but will be release at half the amount from two injection sites rather than the full dose from one injection site as it was done last year. The hope is that the concentration levels will be more consistent throughout the 16-mile span of river this year. The task force is hopeful that we will see similar results as last year and reach up to 95% hydrilla control. More information about Hydrilla from the Eno River Hydrilla Management Task Force can be found here. A quick fact sheet can be downloaded here. More information about Hydrilla from the North Carolina Agricultural Extension Service website can be found here. Recent news from NC DENR on Hydrilla can be found here.